CT State is proud to announce an increase in the use of drug drop boxes in 2018. The drug drop box program helps save the lives of Connecticut children as well as the environment. Unwanted medication should not be flushed down the toilet or sink! In CT, there are several ways that consumers can safely dispose of unwanted medications. Although using the toilet or sink prevents someone from accidentally taking the medications, disposing of them in this way causes water pollution and has adverse effects on septic systems, sewage treatment plants, fish and other aquatic wildlife. Trace amounts of all kinds of drugs have also been found in some drinking water supplies because they pass through septic systems and sewage plants untreated according to the CT Department of Environmental Protection. In addition to disposing at a drop box, families can dispose of medication safely at home by running medication under hot water, combining it with an undesirable material, sealing the container, and throwing it out. 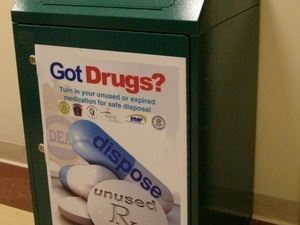 Safe disposal options for drugs can be found here. For more information, please see the CT State Department of Consumer Protection website here.